Our idler rollers come in 1″, 1.5″ and 2.5″ widths, with diameters from 2-3/8″ up to 7″. Available in formulations specifically tailored for light-, medium- and heavy-duty applications, we have a roller to meet your needs. Idler rollers are available in Kryptane® polyurethane, which has superior abrasion resistance and mud-shedding qualities, or rubber. Kryptane® urethane encapsulates a double lip sealed bearing. High quality rubber locked over a steel bearing housing. Bearing surrounded by a nylon core and bonded to urethane. 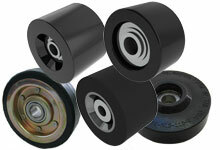 Polyurethane rollers provide superior abrasion resistance. Solid polyurethane formulated for light- to medium-duty applications.